Despite the title Lucy Is A Band, Lucy Loves Schroeder's full-length is packed full of charged, explosive guitar-rock that ignites from the first strike of the guitar through the hard hitting rhythms that each song boasts. Bouncy and quite poppy, the songs make you want to move, while the hooks and sugarcoated choruses have you singing along in no time at all. 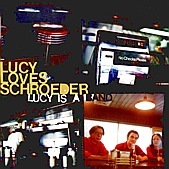 This is modern rock with a pop penchant, something that often comes off as fake and contrived, but sounds natural and alive when Lucy Loves Schroeder tackles it. I'll give this an A-.